Kathryn returns to Av'lor after seven months on the Daemon home world, only to discover the Daemons have invaded Earth. With Av'lor on the brink of an uprising and an unknown enemy upon its doorstep, the knights divide their forces to safeguard both worlds. Sir Lanclor, torn between his duty to Av'lor and his dedication to Kathryn, finds himself fighting a losing battle on Earth. 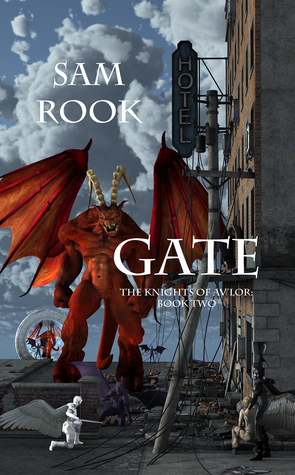 He realizes the fate of both worlds rests in the unlikely alliance of technology and magic. Overwhelmed by a new threat far beyond that of the Daemons, both Av'lor and Earth must face a devastating reality. Lanclor passed the armor to another knight. "Find a Graywing to repair this so Lady Kathryn doesn’t have to go without." The knight nodded and pressed the armor to his chest as he headed toward the nearest group of Graywings. "You’re right. This location is only temporary. We don’t know why there are so many Daemons and Zahkrinon in the area, so staying this close to their location is too risky. Hal, join us a minute." "Sure." Hal jogged over and crouched beside Lanclor. "I need you to start talking to the soldiers. They could be our ticket to forming an alliance with Earth. We could then find out how many Daemons could be in the area and what tactics they’ve already tried. If we don’t find shelter and enough food to sustain this campaign, then we won’t be strong enough to defeat them." "Yes, Sir Lanclor. I’m sure—"
Zahkrinon and Daemons approaching from the west. They’ll be over us in a matter of minutes, a scout whispered in their minds and the camp fell silent. Sam will be awarding $10 Amazon or B/N GC to a randomly drawn winner via rafflecopter during the tour. Mai, I would like to meet Avril Lavigne to discuss her struggle with Lyme Disease. I've been battling Lyme and a couple of other co-infections for the last 5 years, so I'd be interested to hear a more personal account of her story and how she made it through. Great excerpt, thanks for the giveaway! Sounds interesting, where do your character names come from? You're welcome, Patrick. Good luck with the giveaway! The cover grabs your attention and then the excerpt finishes pulling you in! Thank you for the great post and contest!